For the Leisure and Professional Boating Industry, Westerbeke produces high quality marine generator sets from 5.5kW up to 33.0kW at 60 Hertz and 5.0kW up to 26.0kW at 50 Hertz. Westerbeke 1800/1500-rpm diesel generators are backed by a 5-year limited warranty. The presence of Westerbeke in over 65 countries around the world provides customers with easy access to parts and technical support. Established in 1937, Westerbeke is committed to providing its customers with quality products and unequaled after sales support. Westerbeke gasoline generators are exclusively designed for the marine environment. They represent a breakthrough in compactness, quietness, and reliability, all of which are demanded by today's discerning boat owner. By innovating and not following, Westerbeke has always been one step ahead of the competition. Ask any of the world's leading boat manufacturers and they will tell you, it's Westerbeke or nothing at all. For complete details on the entire line of marine diesel and gas generator sets available through R.G. 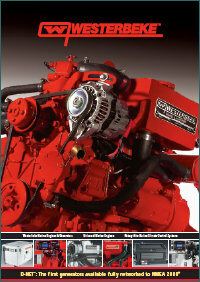 Grove and our dealers, please download our PDF brochure.